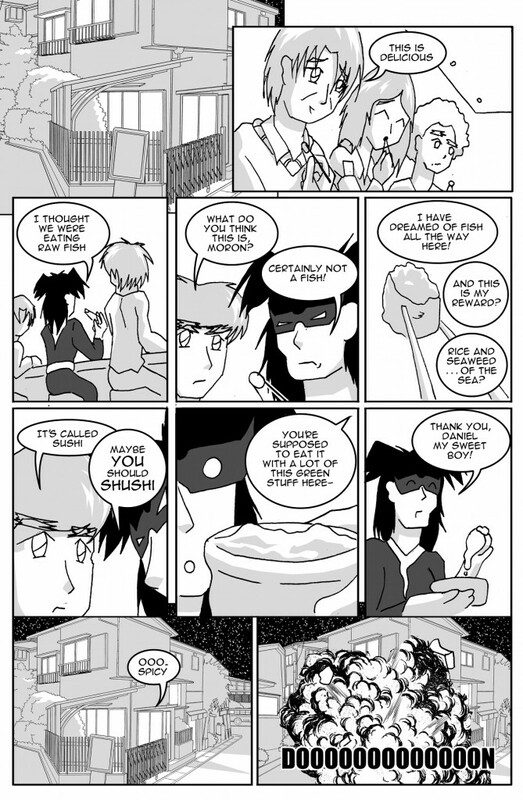 Hello and welcome another page of I’m Famous in Japan! I *had* a good system in place a while ago to get one of these pages out at roughly the same rate as Back Office pages, but the time I’ve needed for that has been in short supply lately. I’m going to be bringing a stricter drawing schedule in the new year, and with any luck more regular I’m Famous in Japan pages. So this time round, we’re visiting a sushi restaurant. Yet again, I’m trying out one of Manga Studio’s building models to depict the restaurant. Usually in a professional Manga setup, you’d have at least one other person to take on the backgrounds, and I suppose I could just do the line-work here myself (I think these are mostly traced street photos), but with little time to play with I went with preloaded buildings for I’m Famous in Japan! Later on, I hope to do some more of the building work myself (some interesting stuff to draw in Tokyo). We’re now fast approaching one of my favorite pages in the script. I hope you won’t have to wait too long to see it!